U.S. embassies across the Middle East and North Africa close as a controversial surveillance program alerted National Security Agency (NSA) authorities to “pre 9-11” levels of alleged “terrorist” chatter on Sunday. The U.S. State Department has announced that diplomatic posts in 19 cities will remain closed at least until end of this week. A spokeswoman said the decision to keep the embassies and consulates closed is a sign of an "abundance of caution" and is "not an indication of a new threat." Britain, France and Germany have taken a similar approach temporarily closing their embassies in Yemen, at least until the end of Ramadan. Intelligence committee members in Washington who had been briefed on the alert said that they were aware of the highest level of chatter in over a decade, and repeatedly cited the threat in the U.S. and calls to resist Congress for reform of the NSA’s sweeping powers. "There has been an awful lot of [terrorist] chatter, which is very reminiscent of what we saw pre-9/11," said the Republican senator Saxby Chambliss on NBC's Meet the Press. "As we come to the end of Ramadan, which is always an interesting time for terrorists, and the upcoming 9/11 anniversary, this is the most serious threat that I have seen in the last several years." Chambliss said he believed the intelligence had been gathered by the NSA using “important” foreign surveillance powers granted under section 702 of the Foreign Intelligence Surveillance Act. 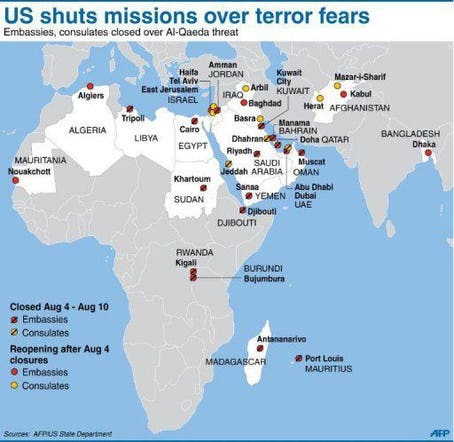 Unlike UK embassies, U.S. diplomatic facilities will remain closed in Egypt, Jordan, Libya, Yemen, Saudi Arabia and Kuwait, among other countries, until Saturday August 10.